Last night, I needed a walk with my dog to calm my nerves. What a summer it has been! Nevermind the upcoming move, the baby, trying to hold down the fort at work, and packing up the old house while renovating the new house. All I wanted was a chance to stretch out my legs and let some of the stress go. My sister had previously intervened, quietly reminding me that blogging is supposed to be the fun part, my creative outlet, and not meant to add to the mounting pressures. When I feel this kind of stress, it acts as a dam for ideas. I find it hard to concentrate and I can’t focus. As I walked through my little town of Beltsville with my dog in the moonlight, I could feel the stress melting away. The ideas started coming again and my mind began to clear. I thought, “I can’t wait to write about all the projects for the new house!” And I began to notice some beautiful sights, just on the streets of Beltsville, in the damp air that follows a storm. 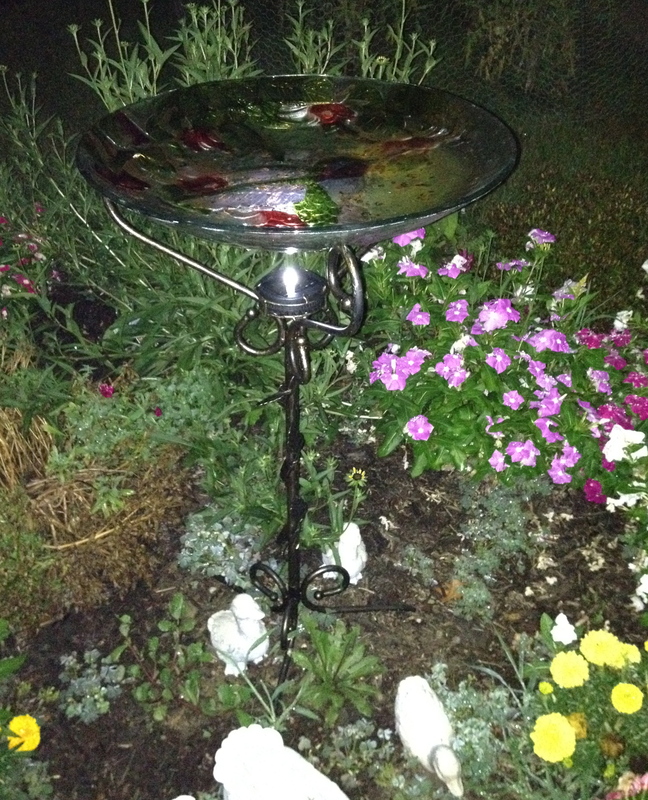 I thought birds were usually asleep at night, but just in case, here is a glamorous little spot for them to hang out. 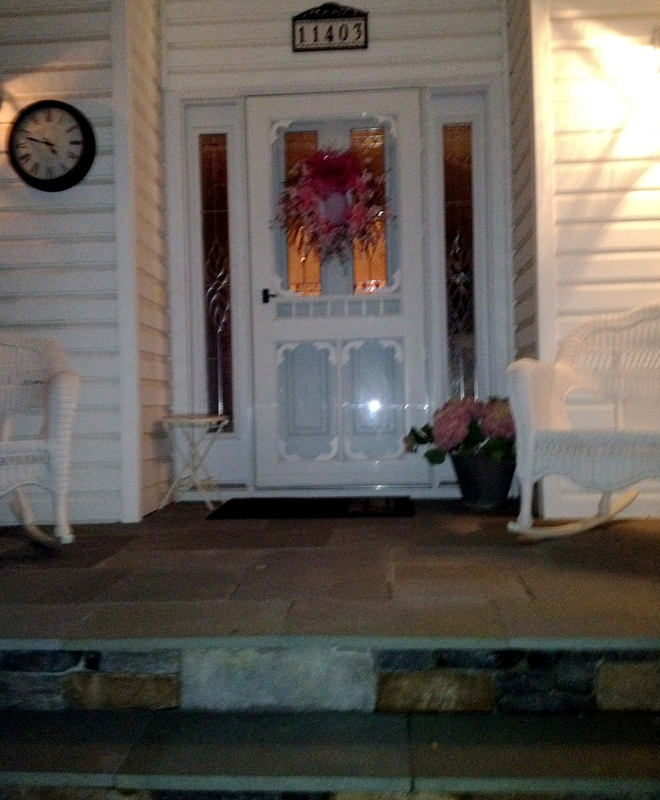 Trying not to disturb any motion detectors as I photographed this front door. 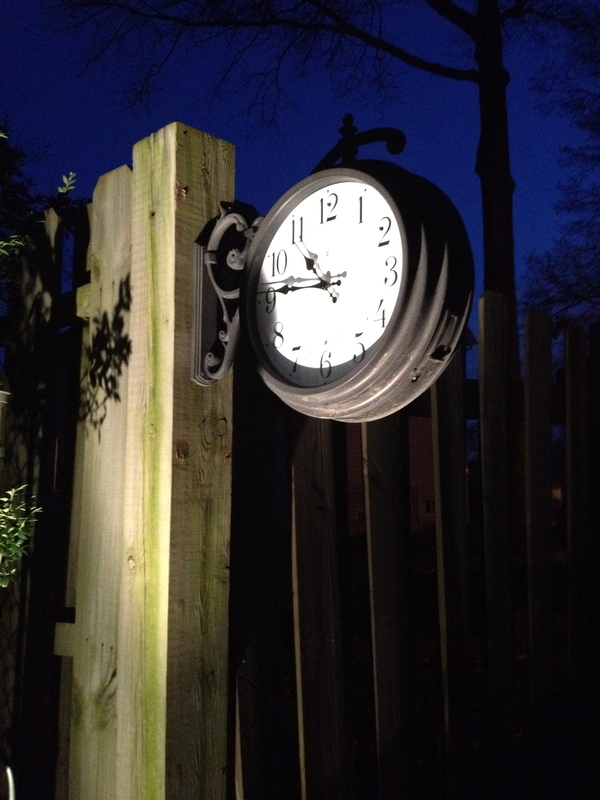 An outdoor clock, for the chronically late. In the next few months, I plan to write about how to tile, making a table out of an old whiskey barrel, fresh wallpaper ideas, showing you befores and hopefully a few afters of the inside of my new house, turning a bird-cage into a light fixture, and some excellent new trash finds. I will probably still occasionally rant about my kids as I return to the baby-up-all-night phase of my life, but I am so excited. Excited to be a new mom again (believe me, Secondo is 9 already, so it will all be new again), excited to move (I blame too many years in the military for this one! ), and excited to be blogging about it along the way. I am stressed, but I am truly blessed and things could not be better. The dog days of summer have arrived. 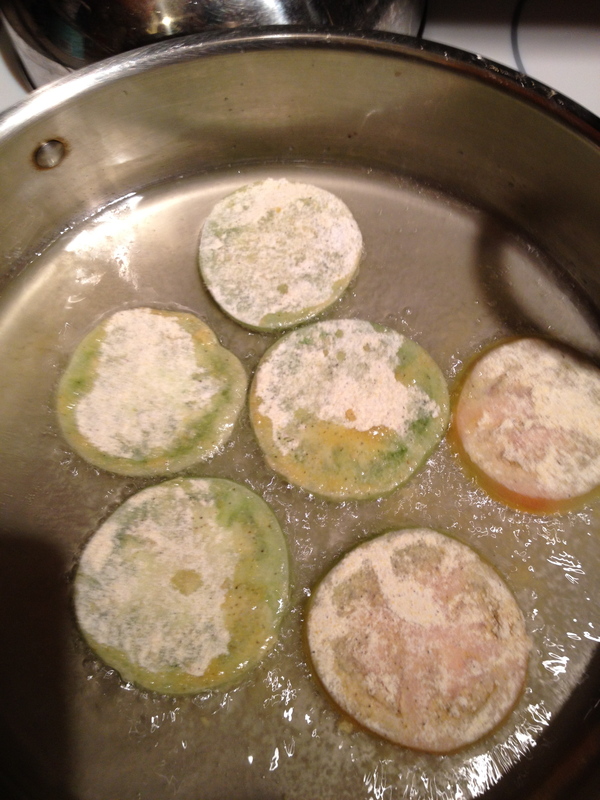 Nothing says summer to me more than fried green tomatoes. They are a beautiful green color, almost the color of a granny smith apple, and their firm flesh only gets juicy once they are cooked up. 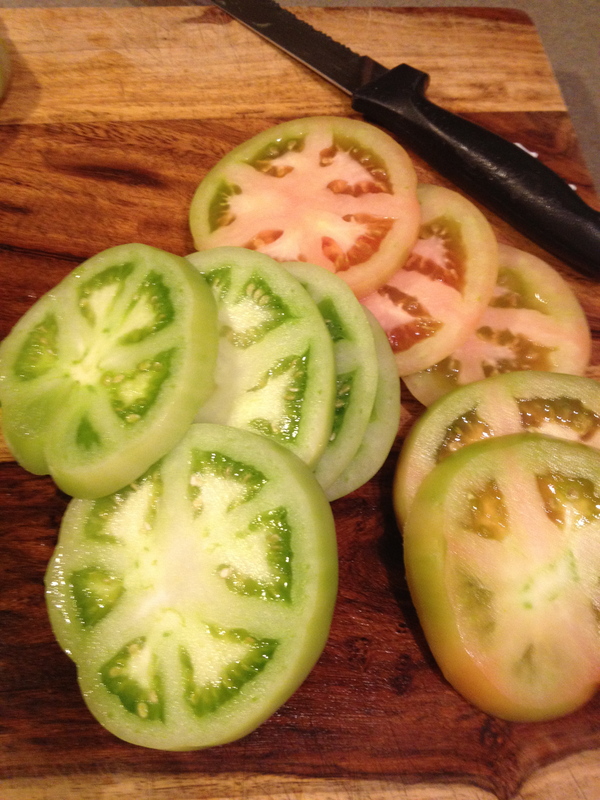 I sliced the tomatoes and dredged them in cornmeal and flour with a little salt and pepper thrown in. Fry them in a good bit of vegetable oil and the aroma smells of summer. Eat them alone or pile some shrimp on top and you have an easy summertime meal. The best fried green tomatoes I ever had were in a restaurant called Bouchon (pig!) in New Orleans. They were crispy on the outside and soft and juicy on the inside. Piled on top were grilled shrimp and a remoulade sauce that was to die for. It was a dish of opposites: hot tomatoes versus cold shrimp, spicy and mild mixed together, and crispy and soft co-mingling together all in one bite. It was a study in contrasts that I have never had before or since. 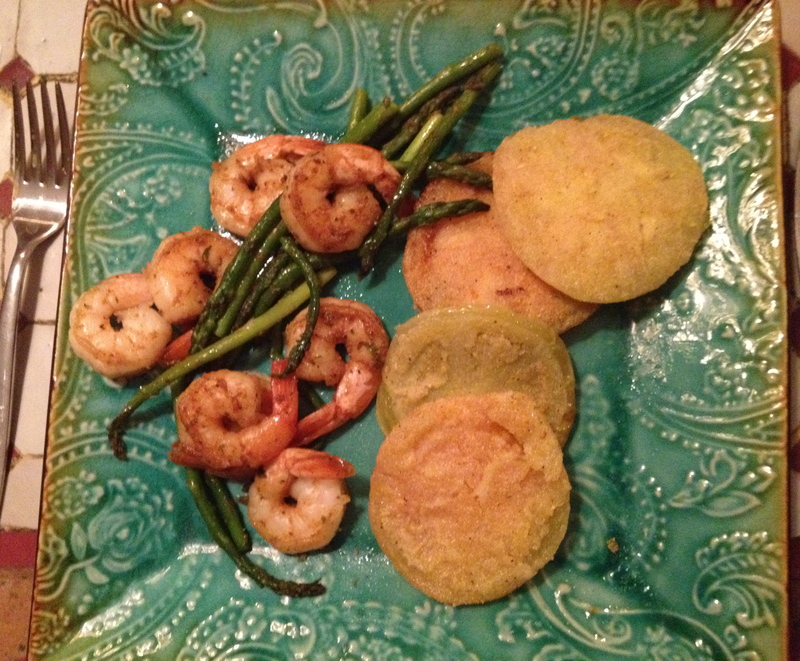 My pathetic and lower-in-fat imitation of Bouchon’s shrimp and fried green tomatoes. That was a magical dining experience that stood out, even among the famed restaurants of New Orleans. I bet you are wondering what this has to do with design. And you are right; nothing really. I just wanted to share the quick summertime meal I whipped up late last night and hope it will inspire you to find some green tomatoes at your farmer’s market and fry ’em up. Or better yet, take a trip to Bouchon and walk around New Orleans, probably my favorite among American cities. You will find plenty of design inspiration there and then you will thank me. Especially while you are waddling around after eating some of the best food of your life and looking at some of the best scenery this country has to offer. Superstition runs deep in my blood. I am constantly running around rescuing spiders because I know it is bad luck to kill one. Of course, the sensible part of me knows this is silly, but I cannot bring myself to intentionally kill a spider. I am afraid of the deluge of bad luck it could bring. I even avoid cracks in the sidewalk. I know, I know: strange. That said, I cannot reveal too much about our latest news, for fear of jinxing it. 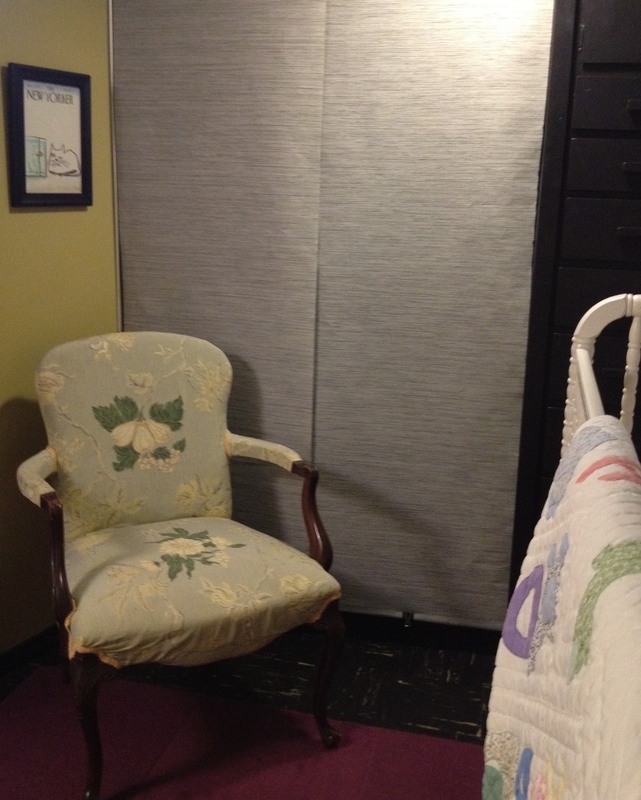 But my husband’s office has been quickly turned into a nursery and I am thrilled with the results. I did not repaint anything, because I painted it only about a year ago, so the color scheme is the same as the old office. We used Benjamin Moore’s, Anjou Pear on the walls, and a light blue called Palace Fountain from Valspar, on the ceiling. I used an ABC quilt that my grandmother gave me as a gift several years ago as inspiration for this room. 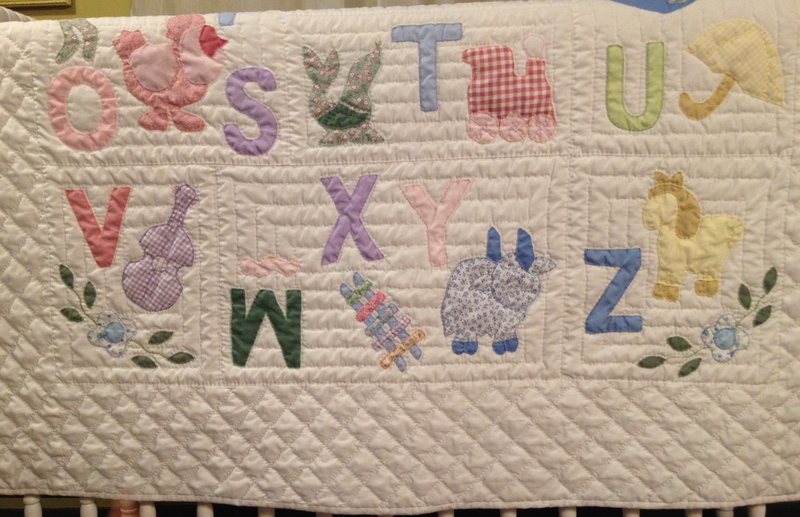 I have always loved that quilt, which she had made for Secondo, my second child, when she was on a trip to Thailand. I also grabbed an old desk from Prima’s room, which could still use a coat of paint, for use as a changing table. 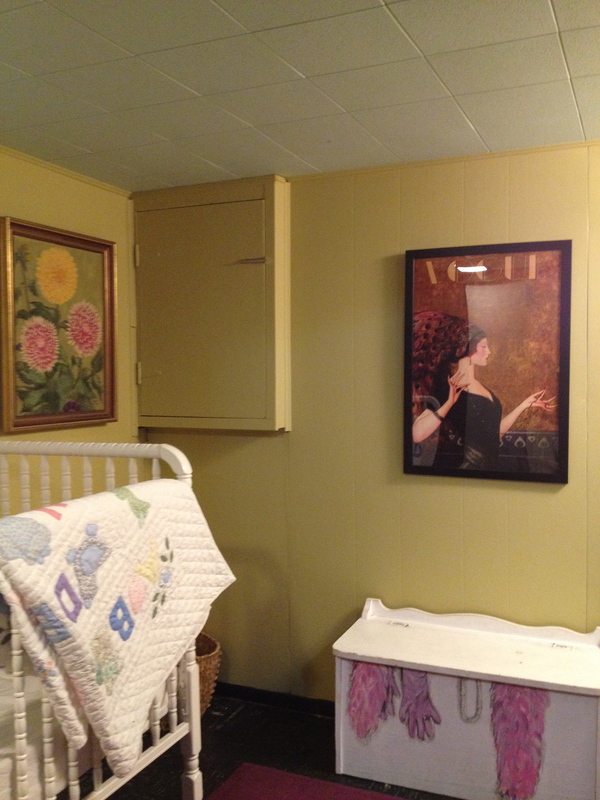 The painting of Dahlia flowers next to the crib is from my husband’s family and adds a pop of cheery color. 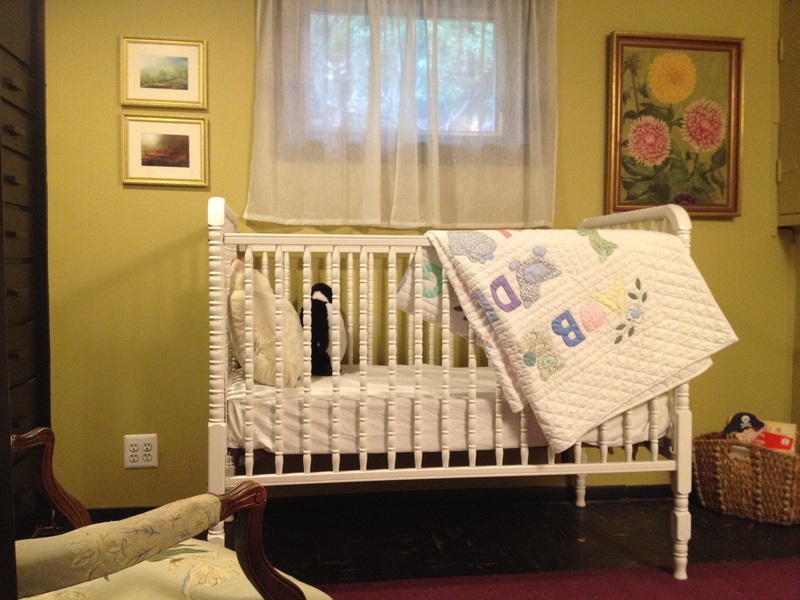 The curtains are stolen from my neighbor’s house and the crib has been on loan for , ummm, like 13 years or so. 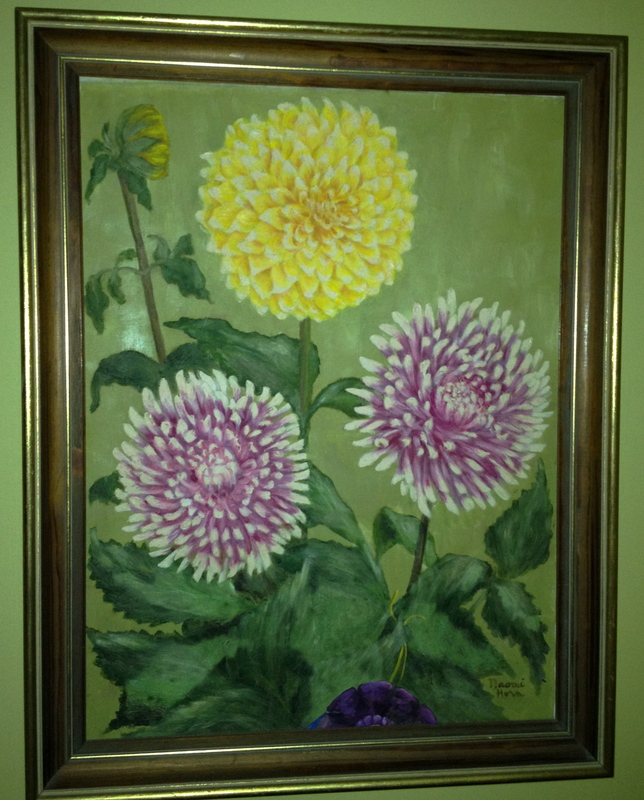 Dahlia Painting, from great-grandpa d’Eustachio. The dress-up box, yanked out of storage, is an old favorite and the chair is pulled from elsewhere in the house. 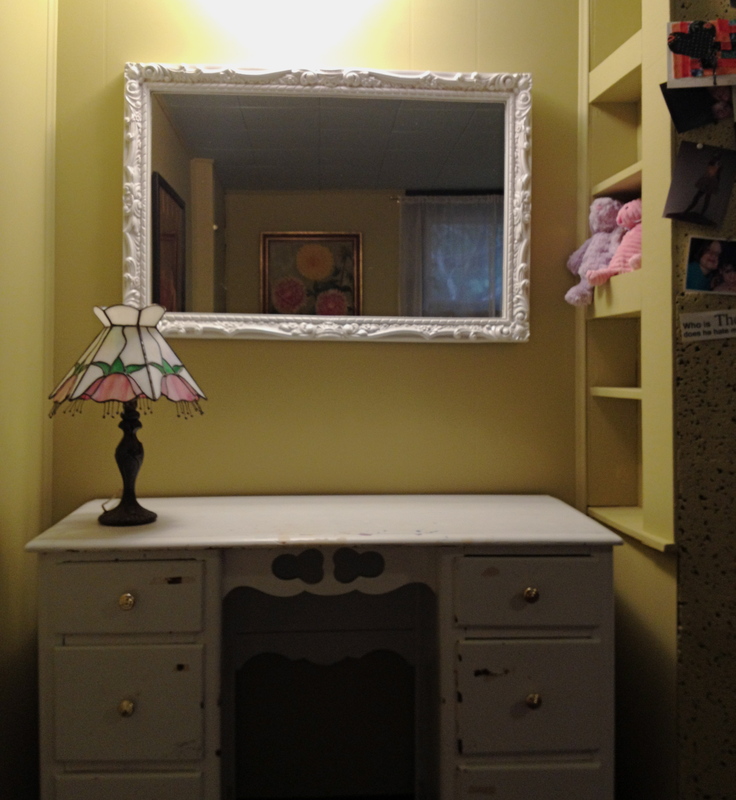 I gave an old mirror, a previous trash find, a coat of white paint. We did not spend any money in this makeover, except for the cheap new light fixture we replaced for $7.00. Chair and New Yorker magazine cover. The stork will be arriving in Beltsville in August and I am thrilled it does not involve a pregnancy, or a delivery, in the traditional sense for me. Sometimes a baby needs a home, and in this case, she will grow up in mine.